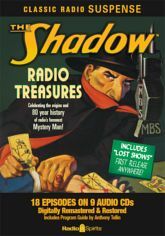 Radio listeners first heard the sinister laugh of The Shadow on July 31, 1930. This 80th anniversary treasury includes two never-before-released shows starring Orson Welles and Margot Stevenson - "Revenge on the Shadow" and "The Hospital Murders"- from previously lost transcription records. This 9-Hour digitally restored and remastered collection also includes the premiere broadcast of the 1937 radio revival, Agnes Moorehead's final network appearance as Margot Lane, and performances by Bill Johnstone, Bret Morrison, Marjorie Anderson, Grace Matthews, Lesley Woods, Richard Widmark, Kenny Delmar, Ken Roberts, Frank Readick, James LaCurto, Santos Ortega, and more. The Shadow's concealed confrontations with mad scientists, evil mystics, and political players�his menacing meddling in the affairs of religious cults and gamblers�his enigmatic escapades all over the globe, from Broadway theaters to exotic Egypt still thrill after 8 decades! Includes Program Guide by Anthony Tollin with photographs and background information about the series.